We have made these wreaths with our children several times over the years both at home and with various youth organizations. 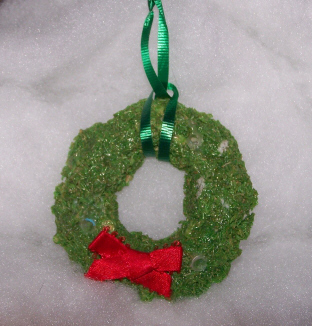 The children really enjoy this hands-on activity and the end result is a great, inexpensive ornament to share with others. The wreath pictured is actually 12 years old and still looks great on their grandmother’s Christmas tree! Turn the mixture over onto the margarine lid and using your hands, press into the shape of a wreath. Press firm enough to hold together, but not too firm that you lose all the texture of the cereal. Don’t worry about it sticking to the lid. It will peel off when dry and have a nice flat back. Using a brush or your finger, coat the wreath thoroughly with non-colored glue. It will dry clear and help make your ornament sturdy and shiny. Allow wreath to air dry. Once dry, you can add three red beads and a bow for decoration. Tie the curling ribbon onto the wreath so you can hang your ornament on the tree! Copyright © 2007 by Shelly Kotulka. All rights reserved.